Blistered heels and the minor embarrassment of carrying a dangling pair of stilettos, barefoot, out of the club is generally a small price to pay for women who want to look good. But if you ask scientists their opinion, they’ll tell you the same: Ditch the high heel obsession if you want to preserve the health of your feet. Everyone has a general sense that high heels are dangerous — the site of a wobbly woman with two bandaged heels is a sure giveaway. Emerging research, however, says there is a lot beneath the skin’s surface we don’t consider. Entire muscle groups, bundles of tendons, and our very bones are put at risk. Consider the 2012 study that found even among women in their 20s, high heels had already changed their normal gait, even when they weren’t wearing heels. 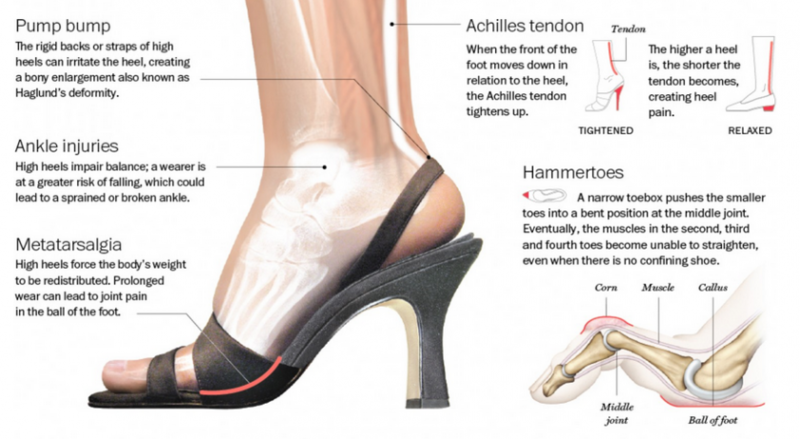 Importantly, frequent heel-wearers had shorter calf muscles compared to the control group, who rarely wore heels, putting stress on the muscles with each step they took. Since tendon movement allows for more efficient walking, over the long haul heel-wearers may experience greater muscle fatigue. But that’s not all. High heels drastically alter the wearer’s posture, displaces the foot and ankle bones, strains the knee joint, and tightens the surrounding tendons. They can lead to osteoarthritis and hammertoe, due to many shoes’ narrow toe box. Of course, all that may be moot if dressing to impress is worth a few hours of agony. On the night of a big occasion, who has the time or energy to think about future bone health? Not classy.